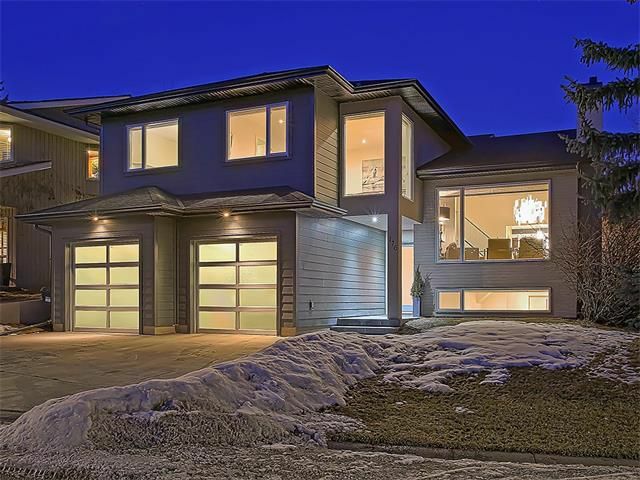 Stunning Ranchlands contemporary executive home! Beautifully appointed in & out, no detail has been spared in the renovation of this home. Enter into an expertly designed layout, ideal for entertaining & relaxation, with extra high ceilings & elegant finishes as you step down into a formal living room & on through to a spacious office & a family room centering on impressive floor-to-ceiling fireplace; sleek hardwood floors flow & expansive windows flow into a bright dining space and a gourmet kitchen outfitted with elite stainless steel appliances, a spacious island, and tons of cabinetry. Step out to the massive yard, sunny & privacy-fenced. All the bedrooms are generous, including a master that is a true retreat, with a dreamy, spa-inspired ensuite. The lower level houses a versatile rec room, with large windows & a cozy fireplace. Situated on a lot with mature landscaping in a desirable community. Schedule your appointment to view this amazing home - call today!